This month’s mission was about our grocery habits, and trying to make some different choices. Specifically, we aimed to cut down on the amount of plastic we consumed in order to feed ourselves. This would manifest differently for everyone, but certainly each of us could be more mindful of our purchases. For me, I found parts of this mission to be natural, and other parts to be difficult. For example I’d always bought my Earthbalance™ in a new tub, because my co-op only carries the non-organic in bulk. But this month I switched to bulk, by bringing my own pyrex tupperware. Ain’t it cute? Earthbalance™ uses non-GMO and pesticide free ingredients anyway, so organic isn’t totally necessary. And buying this way was so much cheaper! Like, really really cheaper! It may not be a lot for most people, but as far as I’m concerned it’s WAY too much for me. So I’m going to keep this challenge going another month. I’ll collect all my plastic again, and see if I can’t cut down even farther. I’ll make sure to let you guys know how it goes. So tell me guys, how did this mission go for you? Do you consider yourself successful? Did you learn anything, or make any permanent changes? Let me know how it went! When you buy your earth balance in bulk like that how do they charge you? Same goes for if you are buying any other liquid bulk, shampoo, peanut butter, maple syrup, oil…etc. Do they just weigh the container as well or do they have a way to tare off the price of the container? Packaging really kills me. Once I get a new place and have somewhere to compost, it will be just about the only thing in my trash! It’s sort of…ironic (for lack of a better term) that now, at the end of the month, I’m going to be reducing my plastic drastically. I’ve got a bunch of those Green Bags I’m going to use for produce at the store. I just got a few cloth produce bags as well. And the biggest reduction in plastic will be the lack of two plastic water bottles a day from work. My Klean Kanteens finally got here. I was having to refill from waterbottles at work since no drinking fountain around here works. Now I can bring 54 oz of water with me to work! I’m still trying to reduce plastic in other places. I’d be afraid to take a picture of all the plastic we use in a month. It would probably be really sad. In some ways I did better and in some ways I did worse. We are finally moving back to Seattle, and in preparation I really haven’t been grocery shopping in the past several weeks, but we have been eating out more often than usual, which generates all those carry-out containers. Yuck! Here’s one tip that I got from a friend to aviod those containers: she keeps a metal tiffin in the trunk of her car to bring inside when she eats out so that she can put leftover’s inside. I was going to buy a couple of cute plastic ones online so I could throw them in the microwave. But then you pointed out that the plastics leech chemicals and I looked on amazon and realized the containers weren’t microwave safe anyway. When we get settled into our new place I’ll be ordering dishwasher safe metal ones, that can also be used as lunch boxes for me and my husband. One other thing I did was opt for glass containers when possible or at least recyclable plastic ones. 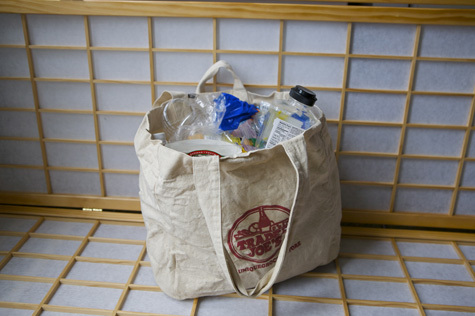 Thankfully the Seattle area is a much more environmentally friendly one than the Phoenix, so cutting down on non-recyclable plastics will be a lot easier. I know you’re disappointed, but I applaud you for your efforts. Living with roommates, it’s tough to influence them without sounding obnoxious. Some our plastic or glass doesn’t even get recycled! :-( Keep up the good work – plastic is almost impossible to avoid, just keep demanding glass or paper products and we’ll make that change happen sooner rather than later! Earth Balance in bulk?! Brilliant! I need to search for this in Seattle. I go through that stuff like crazy. @ Allison – Most places that sell in bulk keep a scale by the bulk area. 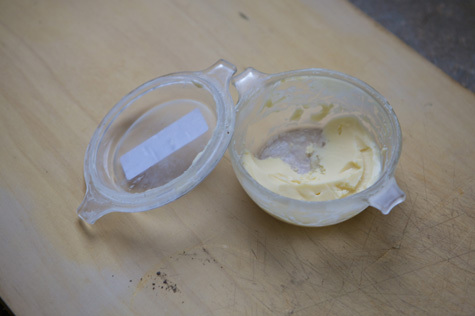 So you just weight the container empty, and then write either on a piece of paper (carefully labeled if you’re getting a of of stuff) or on a sticker on the container itself (you can see it on the lid of my butter dish). Just write the ‘empty weight’ and the products bulk code, and then they will re-weigh it full at the checkout. This works for any bulk product. @ Valerie – Yes! Bringing your own containers for leftovers is such a great habit to get into. Great advice. And those tin tiffin containers are awesome. I’ve heard great things. @ EroSan – What a cool idea! Ha, I love it! @ Kelly – I’m *sure* you’ll be able to get it in Seattle . . . not sure where, but I’m certain of it! the woman who made it has gone over two years virtually plastic free! 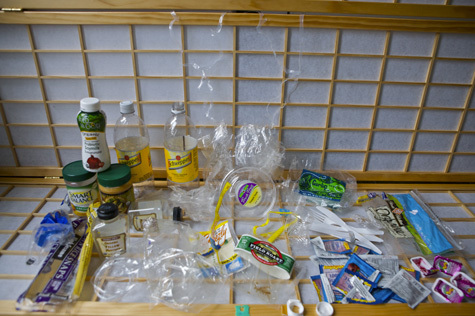 (the amount of plastic she acquires in a year is less than your photo above) she has loads of tips & product suggestions for the plastic free living that really helped/inspired me, you should check her out. @ brown – Yes, that woman is awesome! Much more successful than me, haha. But really, it’s a great resource – thanks for passing along the link!